This beautiful, cheerful door décor features brightlycolored daisies in shades of lavender, orange, white and pink atop a green scrolling base. 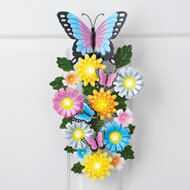 Pretty butterflies and a "Welcome" banner are the perfect finishing touches. Iron. Easy assembly req. 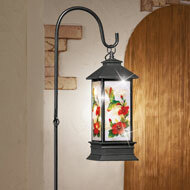 12"L x 16 1/2"H.
Welcome guests to your home with this festive and unique door décor. 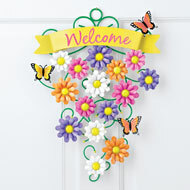 A "welcome" banner at the top is accented with a red butterfly that sits atop a scrolling iron design. 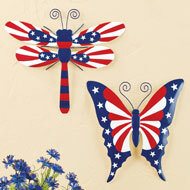 Perfect indoors or outside, the red, white and blue butterflies add a patriotic touch. Hook makes hanging easy. Iron. 12 1/2"L x 17"H.
Welcome guests to your home with this festive and unique door décor. A "welcome" banner at the top is accented with a red butterfly that sits atop a scrolling iron design. Perfect indoors or outside, the red, white and blue stars add a patriotic touch. The handpainted piece is easy to hang, some assembly required. Iron. 12"L x 16 3/4"H.
Credit the artistry of nature for this colorful, detailed 3pc. set of wall art. For use outdoors or inside. Crafted of painted iron with hook on the back for hanging. Largest: 17 1/2"L x 14"H.
Richly detailed butterflies in gorgeous colors are featured on this unique wall art. Five butterflies in neutral shades of tan, burnt orange, brown and white each have intricate markings, textures and dimensional details. Hardware on the back makes hanging easy. Iron. 29 1/2"L x 14"H.
Beautifully detailed and brightly colored butterflies are featured on these stunning and unique wall art pieces. 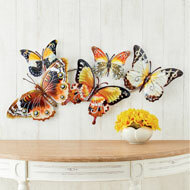 The set includes three butterflies painted with lovely colors and dimensional details. Hooks on back make hanging easy. Iron. Each is approx. 14"L x 11"H. Set of 3. 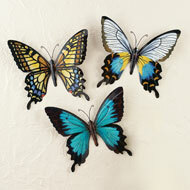 Instantly add color and dimension to your home with this set of three beautifully detailed butterflies. Each features a 3dimensional design and realistic coloring. All have hooks on back for easy hanging and can be arranged however you please. Iron. 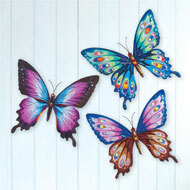 Each is 14"L x 11"H.
Instantly add color and dimension to your home with this set of three beautiful butterflies. Each features a detailed design with lovely colors in shades of purple, blue, brown and pink. All have hooks on the back for easy hanging and can be arranged however you please. Iron. Each is 13 3/4"L x 12 3/4"H.
This beautiful and unique wall art features dimensional butterflies in lovely colors that are accented with sparkling faux jewels. 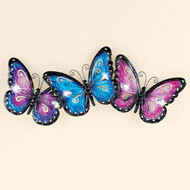 The blue and purple butterflies are intricately detailed and include a hook on back for easy hanging. Iron and acrylic. 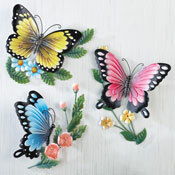 Measures 24 1/2"L x 10 1/2"H.
Instantly add color and dimension to your home with this set of 3 beautifully handpainted butterflies. Each features a 3D design with finely detailed flowers and greenery. All have hooks on back for easy hanging and can be arranged however you please. Iron. 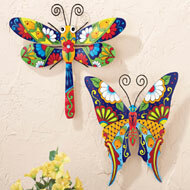 Largest butterfly is 9"L x 11"H.
Festive designs and bold colors will bring summer style to your home, indoors or out. 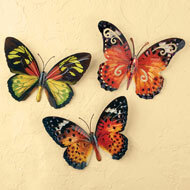 Choose the butterfly or dragonfly, or both for an impressive display. Hooks on back make hanging easy. Iron. 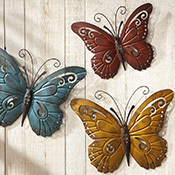 Butterfly is 12"L x 13"H, dragonfly is 14 3/4"L x 13"H. Styles available in Dragonfly or Butterfly. This beautiful floral décor is the perfect way to add color and light to your home. Featuring multicolor dimensional flowers accented with bright butterflies, the lovely arrangement is enhanced by 7 sparkling lights. Requires 2 "AA" batteries (sold separately). Hook on back for hanging. Iron. Approx. 9 1/2"L x 2 1/4"W x 18 1/2"H.
These elegant cherry blossom branches add color, texture and dimension to your home. 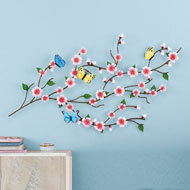 Featuring carefully handpainted cherry blossoms and beautiful butterflies in a unique, threedimensional design, this metal wall art is perfect anywhere in your home. Hooks on back for easy hanging. Iron. Easy assembly required. Approx. 35 1/4"L x 1 1/2"W x 19"H.
Displayed on a fence in your garden or a wall inside your home, this patriotic butterfly and dragonfly each features a red, white and blue star and stripe design. Iron. Each approx. 14"L x 13"H. Set of 2. 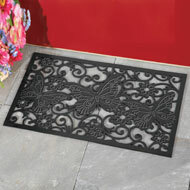 With the look of elegant wrought iron, this durable rubber mat features a charming butterfly and floral design with scrolling details. The design helps keep dirt and debris from entering your home and the rubber construction is skidresistant. Simply hose off to clean. Imported. 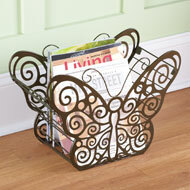 30"L x 18"W.
Keep your reading materials organized anywhere in your home with this beautiful magazine holder. It features a lovely scrolling butterfly design on both sides and an antique bronze colored finish. Iron. 17"L x 8"W x 12"H.
This beautiful and versatile corner shelf will add display and storage space to any corner of your kitchen counter. 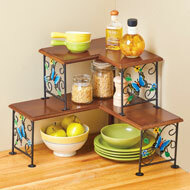 It features a scrolled metal design with butterfly and floral accents and two tiered shelves. Easy assembly required; hardware included. Iron and wood. 15 1/2"L x 15 1/2"W x 13"H.
A sweet sentiment and beautiful colors make this suncatcher a wonderful gift for someone special. Hang it in a sunny window for a stunning view every day! 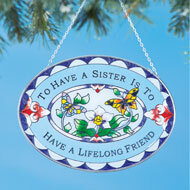 The beautiful floral and butterfly image in the center is surrounded by a border that reads, "To Have A Sister Is To Have A Lifelong Friend". Includes a chain for easy hanging. Glass and iron.  Measures 9"L x 11"H with chain.